Creating surrealistic wine packaging design happens rarely in my practice. First because I feel myself more abstract person rather than surrealistic and second, clients who would accept surrealistic idea are really rare breed. You can’t meet them every day. And even though everyone is special and unique as individual these people always challenge me sometimes even without realizing what they do. It’s always strange, unpredictable and exciting process of creativity and hard work. 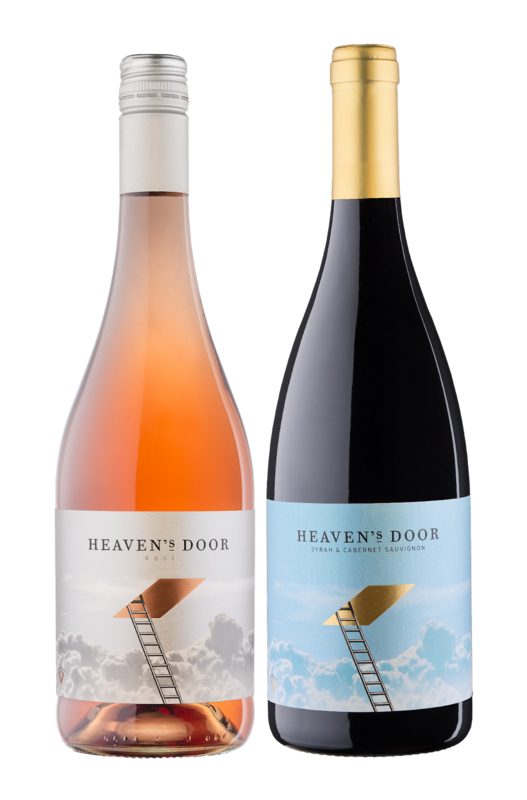 The idea of Heaven’s Door name belongs to one of the owners of the winery. When I first heard it I really had no idea what to think and which direction to take. Was it about religion, angels, clouds…. really had no clue where and how to start this. So, I wrote a long email with dozens of questions and thoughts about the name and this was a start of a long brainstorming process. We went back and forth with different keywords and ideas – each of us sharing own thoughts and impressions about the project. After we’d said everything we could I started working hard – not on my computer, in my thoughts and with my fantasy. After such extensive and interesting discussion, I was deeply convinced that an extraordinary label was going to be designed soon. In fact, I had a pretty clear feeling I was about to create a surrealistic wine packaging design – that was the only good answer to match this provocative wine name. I started with clouds – I wanted to have calm and peaceful background and the clouds were the perfect solution for this. I did not want to have dramatic colorful skies, I was looking for more heavenly white clouds and serenity – like flying with jet above the clouds in a sunny day. Using a photo-realistic image in wine label design is something I rarely do but here it was excellent choice to create memorable label with easy-to-manipulate background. I used old version of Bodoni typeface to type Heaven’s Door title and I nearly had the true feeling the label is almost done. But I couldn’t just put clouds and text and that’s it. I needed something to express the idea behind Heaven’s Door in a very memorable way. I thought about door, steps, maybe stairs. Then I thought of replacing the door or gate with simple element expressing the idea of an ‘opening’. We had one direct symbol – the clouds. The door was second direct symbol. And the stairway was the third. The door was between Heavens and the stairway, so my ‘Stairway to Heaven’ needed not just a simple door or gate, but an abstract opening to pass thru. And this is how the idea of this gold foil rhombus at the center of the label came. It was the link between two realistic elements and it was at the same time the key element to turn the whole project into a surrealistic wine packaging design. 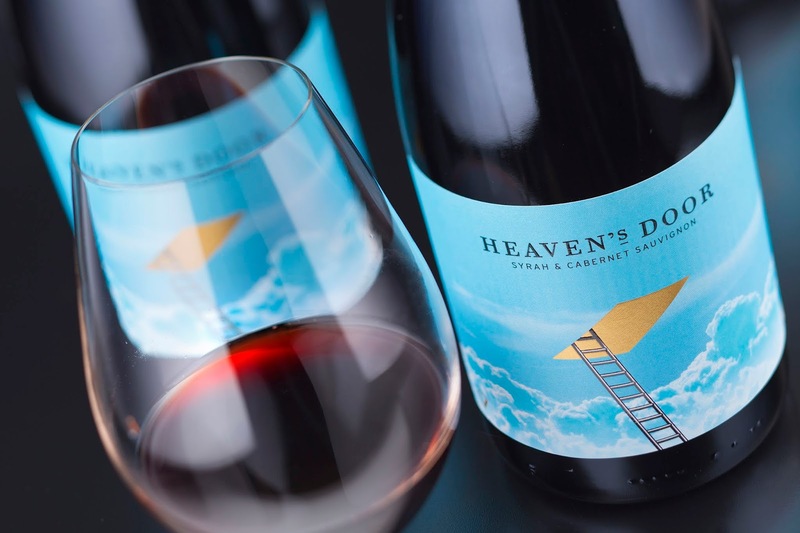 It is very spiritual label concept flying high above the clouds while carrying the idea of perspective, new horizons, enlightenment and divine contact with the magic of wine. 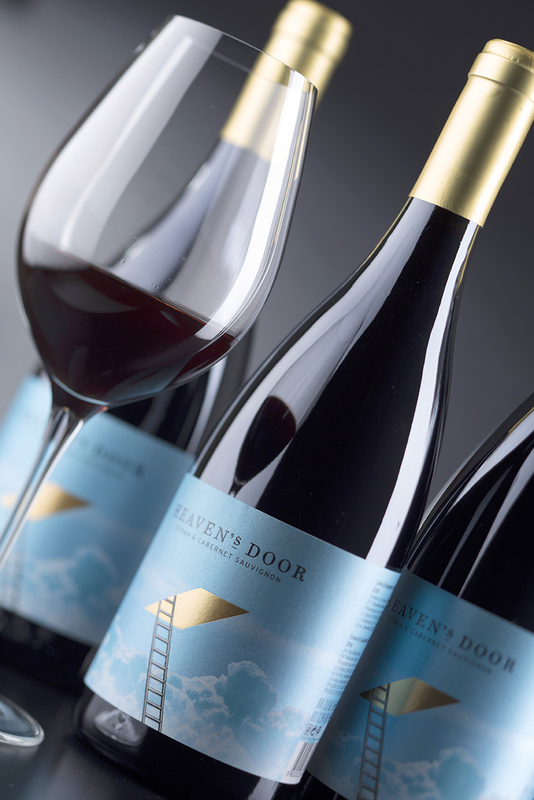 Heaven’s Door is not just another label on the map – it is one of my attempts to open a new page in my professional world by creating surrealistic wine packaging design for these beautiful wines. The series consists from one red and one rose wine. It will soon expand with few more. I plan to do them in different colors preserving the idea of my initial design. The bottle is produced by Vetreria Etrusca. It has very elegant and smooth shape and absolutely gorgeous dark color with low saturation. The paper for this label is Constellation Jade Raster. I use this paper very often because its finish adds more elegance and shine to the artwork without dominating it. In this label paper helped me a lot because of its pearl surface reflections – it makes the skies look almost metallic and the clouds absolutely photo-realistic, because I printed white overlay and thus made the background behind them paper-white which was my secret hint in this surrealistic wine packaging design.